Courtney Conlogue started surfing at age 4 and has been drawn to the ocean ever since. Courtney Conlogue is the kind of California kid who was good at almost every sport she tried. She could have pursued track or soccer, but her heart was in surfing from the moment her father put her on a board at age 4. "What kept me interested in surfing so much is going out on the ocean and trying to predict the unexpected," Conlogue said. "You're a part of nature and you're out there and the water is moving and there's so much going on. And you're just one with the ocean and trying to gain that connection." 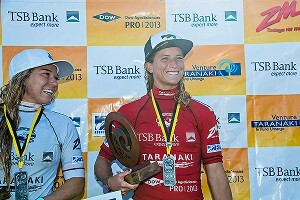 Conlogue won an event in New Zealand in April, and is in the hunt for her first title as ASP women's world champion. Now the 20-year-old is a three-year veteran of the Association of Surfing Professionals, ranked fourth on the list of elite pros and set to compete for the Roxy Pro title in Biarritz, France. She won an event in New Zealand in April, and is in the hunt for her first title as ASP women's world champion. It's a challenge she relishes. "You don't understand the power of what the ocean has until you see 20-foot sets coming," Conlogue said. "You're looking at the waves on the horizon stacking up and thinking I've got to get one of these and you start paddling for one. And you start feeling the wave sucking you up the face and you're paddling as hard as you can and you feel it sucking up and you drop in and you just look down the line and you're setting the rail as quick as you can. And it's definitely an adrenaline rush." Conlogue, 5-foot-8 and 140 pounds, is rigorous about her training and nutrition. She is part of a new generation bringing a scientific approach to a sport known for its laid-back lifestyle. Tour spokesperson Dave Prodan said it has improved the quality of competition. "Her generation has completely turned the performance paradigm on its head," Prodan said. "They're stronger, more powerful and more stylish." At first, Conlogue said, she got the side-eye when she would warm up before her heat by doing hops and squats to get her body ready to compete. And she continues to find ways to improve her strength and stamina. She has recently incorporated cycling as a way to build endurance while staying lean. "I'm built to build mass. When I was in my track days I had Apolo Ohno thighs," she said, referring to the Olympic champion short-track speedskater. "That doesn't really work for surfing." Surfing has widened her world. Now she regularly travels to Europe and Australia, but there was a time when a trip to Rhode Island seemed exotic. Conlogue hopes to one day surf the coasts of Ireland and Africa. "I'm still kind of hunting for my dream wave," she said. "I haven't found it yet." Her mother, Tracy, remembers one of the first times the sport took them on the road, when Courtney was 13. "We needed to go on a trip to the East Coast for her sister's school and a surfing contest in Virginia for Courtney," Tracy wrote in an email from France. "We decided that the whole family would enjoy making the trip. We flew to Virginia for the surfing contest which Courtney ended up winning, followed by renting a car and driving to South Carolina and continued to drive along the coast to Rhode Island. We surfed several locations in every state. ... There's nothing like a surfing road trip." When she is home, Conlogue likes to paint. She works on canvas using acrylics. When she started, Conlogue liked to work in small spaces, concentrating her brushstrokes. But over the years she has loosened up, using larger canvases and opening up to expansive lines. "I like to work big," Conlogue said. In her case, art is imitating life.